GoGo Foundation Award 2015 given Prof Dr Bhagawan Koirala, former Executive Director of the TU Teaching Hospital & Sahid Gangalal National Heart Center. During his tenure, Dr Koirala had played an examplery role to promote internal good governance in these hospitals to improve better service delivery. The Award distributed amidst a special function held on 11 February 2016. Rt. Hon'ble Kalyan Shrestha, Chief Justice of Nepal was the Chief Guest of the Program. On behalf of GoGo Foundation, we sincerely congratulate to Dr Koirala being first time reciving GoGo Foundation Award ! 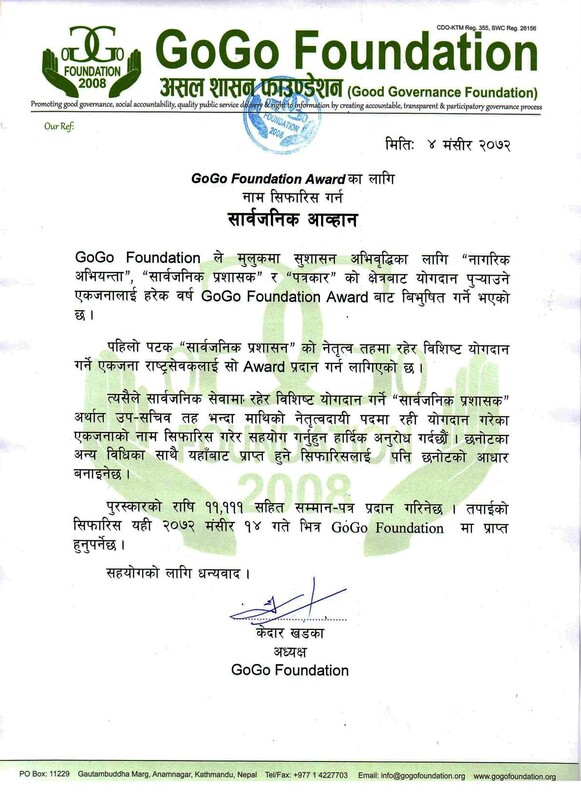 GoGo Foundation established 'GoGo Foundation Award' to good governance promoters in Nepal. The foundation had set up a grant a year ago for the award with generous contributions from institutional members and individuals from home and abroad. GoGo Foundation has selected three categories of people - Media Journalist, Government Official and Civil Society Activist for the award each year who must have made remarkable contribution to promotion of good governance and campaign against corruption in Nepal.